Podcasts Archives | Page 3 of 17 | SENSEI ENTERPRISES, INC. The General Data Protection Regulation (GDPR) has garnered a lot of attention in a time where data protection has become a hot topic. But the GDPR isn’t the only privacy law deserving of attention. In this episode of Digital Detectives, hosts Sharon Nelson and John Simek talk to Scott Pink about the California Consumer Privacy Act, a law that aims to give consumers more control over their privacy and data usage. They discuss the rights formally recognized by this act, what kind of businesses it applies to, and whether other states are likely to adopt similar legislation. Virtual assistants market themselves by saying they will save you time and money, but the reality is working with them comes with its own set of cybersecurity risks. 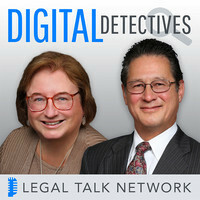 In this episode of Digital Detectives, hosts Sharon Nelson and John Simek talk to Tom Lambotte about the data dangers involved with using virtual assistants and what lawyers can do to protect themselves. They discuss the right questions to ask when seeking virtual assistance and the advantages of having contracts in place. Tom Lambotte is currently the CEO of GlobalMac IT. The Data-Driven Ethics Initiative is a research project that aims to use legal services data to modernize legal rules for professional conduct. In this episode of The Digital Edge, hosts Sharon Nelson and Jim Calloway talk to Erin Gerstenzang about the initiative and the current landscape of ethics reform including lawyer regulations. Additionally, Erin delves into the challenges of ethics reform and how design-thinking can help. Erin Gerstenzang is a criminal defense attorney in Atlanta, Georgia. She primarily handles DUI and other drug and alcohol related offenses. As artificial intelligence (AI) becomes more prevalent and useful, most industries are looking for ways it can benefit them; law firms are lagging behind in dedicating the time and resources to make AI work for them. In this episode of Digital Detectives, Sharon Nelson and John Simek talk to Ed Walters about AI Sandbox, Fastcase’s new artificial intelligence initiative that aims to encourage firms’ experimentation with AI. They discuss common AI projects law firms are working on and why AI is just now beginning to take root in the legal industry even after many years of budding popularity. Lean is a business methodology that’s used by Nike, Toyota, and even John Deere, but what does being a lean organization look like for law firms? In this episode of The Digital Edge, hosts Sharon Nelson and Jim Calloway talk to Larry Port and Dave Maxfield, authors of The Lean Law Firm, about what running a lean law firm looks like and the first steps to adopting lean techniques. 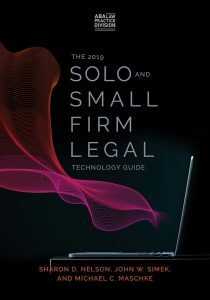 They also address common misperceptions about the methodology and share some key takeaways of the book, such as seeing your law firm as a system and having the bravery to experiment. Print may seem like it’s going out of style but the ABA Journal is still going strong. In this episode of The Digital Edge, hosts Sharon Nelson and Jim Calloway talk to Molly McDonough about news stories lawyers want to read and how the ABA Journal has adapted to changes in media consumption. 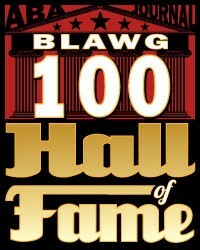 They also discuss the ABA Journal’s role as the primary source of legal technology information for attorneys.